This photo is inspired by a picture I have taken by Lee Miller in the 1930s when she was working with Man Ray, It an amazing picture of a man walking in the snow on a really foggy day in front of a large building, and just visible in the background is the Eiffel Tower barely visible in the fog. And while walking along Bexhill seafront last week the art deco shape of The De La war Pavilion started to take shape I the foggy distance. 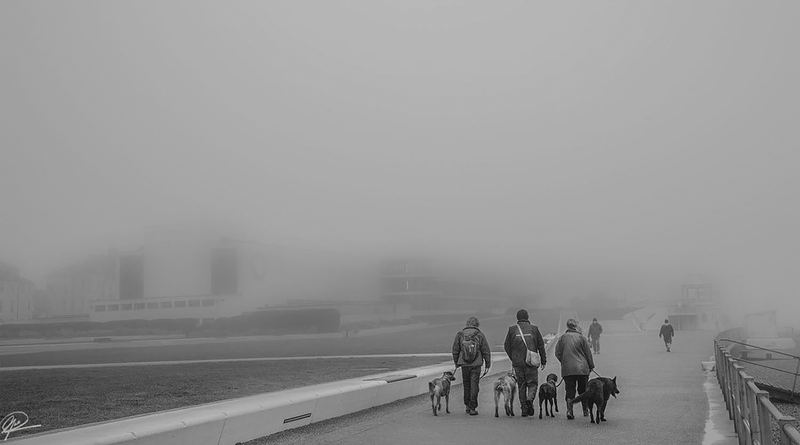 I like this one, the people and dogs walking away and into the fog. That's an unusual subject but well seen and I like it a lot. Very atmospheric with a hint of mystery. I also like this, one that works well with the foggy day, I couldn't see it working as effectively if taken on a bright blue sunny day. Thanks Rye, --your right, from this angle its not a very striking picture opportunity, but the building its-self is just stunning and so photographic form the far side (as you will see if I post one from that angle) as well as a beautiful art dece stair case that I have photographed many times. Very atmospheric one Geoff, the fog certainly gives it a bit of a mysterious look.